Freshman guard Noah Kirkwood dropped 20 points in Harvard's victory over Holy Cross. 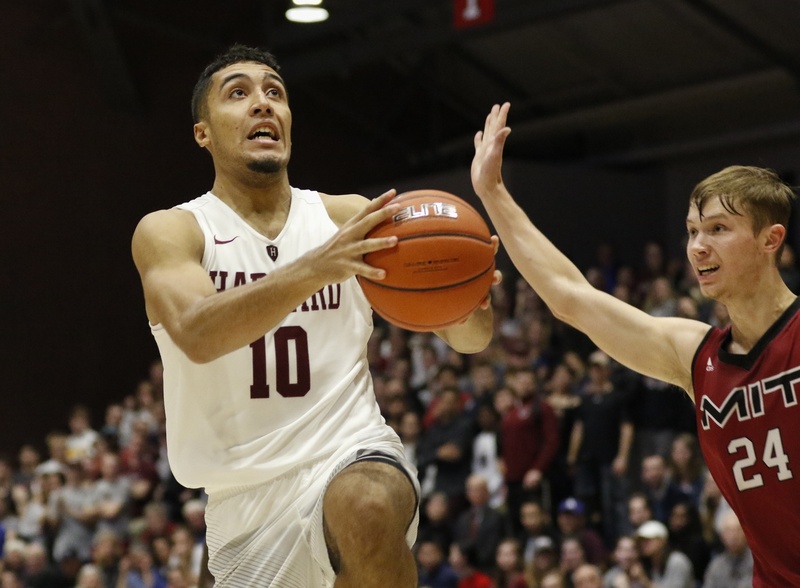 As Harvard men’s basketball seeks its first Ivy League title and NCAA Tournament berth since the 2015 season, the road has been anything but smooth thus far. The Crimson has been dealt a rash of injuries to the starting lineup and much of its junior class. Neither defending Ancient Eight player of the year Seth Towns nor stalwart point guard Bryce Aiken has taken the floor yet this season. In addition to missing Towns and Aiken, fellow junior forward Chris Lewis was sidelined for three games, and Christian Juzang missed last weekend’s nail-biting loss to Vermont, the latest to catch the injury bug. While Harvard’s many injuries have likely contributed to its 4-5 record thus far in non-conference play, it has also provided an opportunity for coach Tommy Amaker to test his team’s bench and balance, a phrase he often emphasizes. While junior wing Justin Bassey and sophomore forward Danilo Djuricic are the only two players to start every game, the team’s injuries have allowed several of the freshman recruiting class to see significant action. If the Crimson hopes to return to the Big Dance, several of the first-year players will be relied upon to provide crucial depth and balance through the gauntlet of the Ivy League season. Noah Kirkwood, Guard, Ottawa, Ontario. In his first season in Cambridge, Kirkwood has been thrust into a prominent role in Coach Amaker’s rotation. The Ottawa, Ontario native leads all freshman and is fifth on the team in playing time with just over 20 minutes per game. A product of the basketball powerhouse Northfield Mount Hermon, Kirkwood garnered two consecutive Ivy League rookie of the week honors. The 6’7” guard scored 12 points in games at San Francisco and Saint Mary’s over Thanksgiving break, before tallying a career-high 20 points in a dominant home win over Holy Cross. Recently, however, Kirkwood has struggled with his ball control and is averaging almost three and a half turnovers per game on the season, after registering nine turnovers across his last 40 minutes of court time. Problems with ball security have plagued the entire team, not just Kirkwood, and are to be expected for a young player who has yet to complete his first 10 games of his collegiate career. Kirkwood’s early performance has been encouraging, and is more than equipped to patrol one of the backup guard positions once Aiken returns from injury. Shooting an impressive 56 percent from the field, and over 45 percent from beyond the three-point arc, the first-year’s ability to score the basketball with efficiency will continue to provide a boost off the bench as the season continues. Spencer Freedman, Guard, Pacific Palisades, Calif.
A product of the strong Mater Dei basketball program, Freedman has played significant minutes early on for Coach Amaker. Just last weekend, with Christian Juzang absent from the lineup with an injury, the Pacific Palisades, Calif., native logged his first start of his career. The 6’0” guard performed solidly against Vermont and will rejoin the backup guard corps with Kirkwood once Juzang or Aiken return. Freedman’s three-point shot, arguably the first-year’s most impressive skill, has yet to translate to collegiate action. Converting at just over 34 percent from beyond the arc, Freedman will look for more shots to fall, which will undoubtedly open up the rest of the floor for his teammates. Averaging just over 16 minutes per game, Freedman provides a slasher/shooter option for Amaker off of the bench, and will certainly continue to see more playing time in the rotation. Mason Forbes, Forward, Folsom, Calif. Although he has only averaged seven minutes per game, Forbes’ role has fluctuated throughout his young career. While Forbes did not see the court against Northeastern, Rhode Island, or San Francisco, the Folsom, Calif., native played crucial minutes while Lewis was sidelined. Forbes has shot the ball judiciously in his limited game action — knocking down four of his five field goals — and has played solid defense. The 6’8” forward will provide Coach Amaker valuable bench depth in the frontcourt, protecting against injury and foul trouble. Cale Katchings, Forward, O’Fallon, Mo. Katchings has yet to see significant game time this season for Coach Amaker. The first-year forward played towards the end of the victory against MIT, but has yet to make his way into the team’s regular rotation. The nephew of WNBA great Tamika Catchings, the O’Fallon, Mo., native was a two-time all-state and all-district honoree in 2017 and 2018 and will provide more young depth in the frontcourt. —Staff writer Amir Mamdani can be reached at amir.mamdani@thecrimson.com.